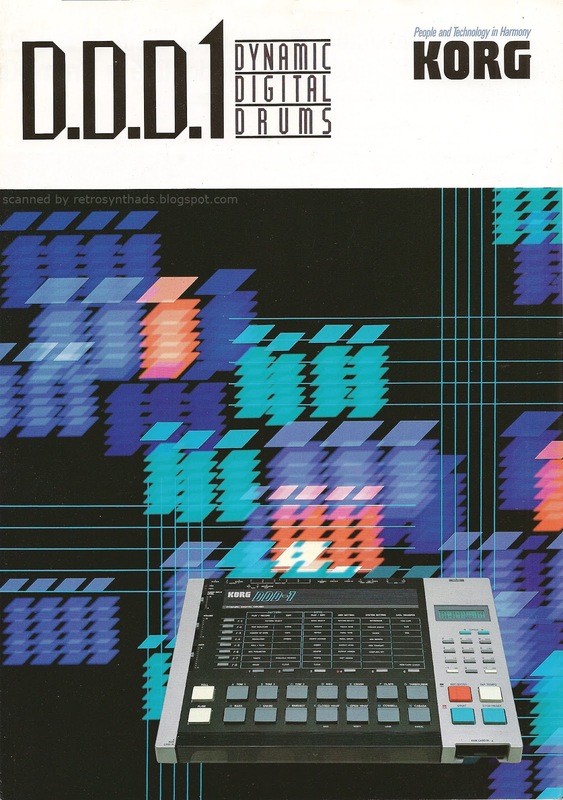 Korg DDD-1 Dynamic Digital Drums four-page colour brochure from 1986. I've been slowly learning that Moog Song Producer software, but that manual is so crazy that I need to take a break and work on something else every now and then. And I gotta say I've also been on a bit of a Korg kick lately that has begun to flow into the blog. 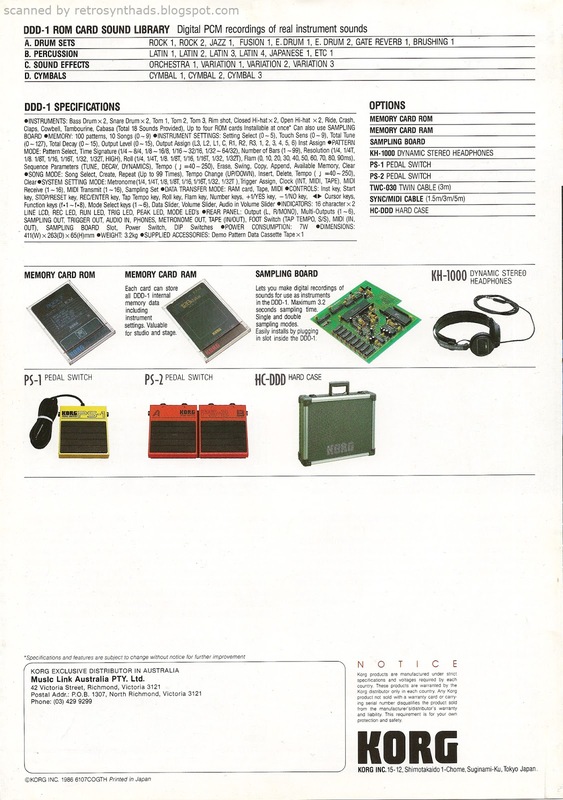 First with that lovely 1982 Korg catalog I last posted, and now with this equally lovely D.D.D.1 (aka DDD1 aka DDD-1) brochure. Where do I begin? How about with that lovely 80s-style front cover design created very much in the style and colouring of the Korg drum machine itself. Stacks of rectangles in the shape of the drum pads representing all sound possibilities the DDD-1 has to offer. Flip open the cover and you've got tons of interesting brochure copy to read inside. Yet the text doesn't feel too crowded thanks to the large main image and plenty of white space between each column as well as each paragraph of text. Makes for a nice, easy read. And flip over to the back, and we see all the specs as well as a few interesting options, including an intriguing sampling board! But I'll get back to that later. - LINN 9000: 18 sounds, $5000+! - Korg DDM-110/220: 9 sounds, can't find a price anywhere!). 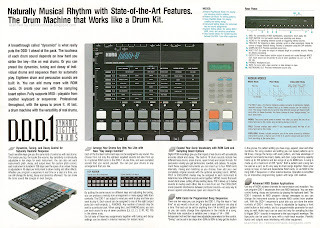 And, now, we slot the DDD-1 into this mix of drum machines with its 18 sounds. All for $995.00. What's that you say? The Roland TR-505 has 16 sounds for only $395.00? Yes, but its not just about the number of sounds the drum machine has. It's also about the features! With the Korg DDD-1, we getting dynamics and tuning. And we can also add more sounds by plugging in up to four ROM cards (from the more than 20 to choose from). Plus, if you shell out a bit more cash, you can get the sampling board, which gives you 3.2 seconds worth of sample time - a lot more time than the RZ-1 had. My point is, the DDD-1 found a nice niche to settle into and a pretty fair price point with lots of future possibilities for expansion. Unfortunately, I could never track down an original price of that sampling board, which would have allowed a better comparison with some of the other sampling drum machines from the time period. I'll keep looking. Now to get back to that Moog Song Producer software I've been slowly learning for a near-future blog post.